Cut into the cliffs near Terrek’s Wall is a solitary sealed doorway. Beyond it is the vault of the famed Lapis Monk, entombed for long centuries. The vault has lain undisturbed for ages – the doorway secured both in construction and by magic. But time has her way. A portion of the cliff face has fallen, exposing an internal passage within the vault. 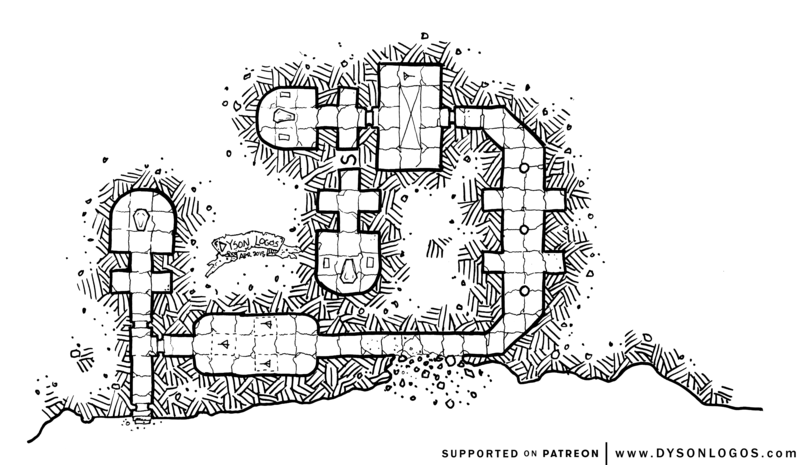 Trapped chambers lay in both directions to those who would explore via this new entrance – but since when did common sense and traps prevent a little bit of dungeoneering? Very cool! I have big plans for this one! Thanks very much! Dyson, this map is just about perfect for a quick one-shot adventure. Thanks for releasing this one. Thanks also for contributing so much to the gaming community.